The Kobold is considered by many a travelling adventurer to be small and harmless. The more experienced adventurer knows that the kobolds use this to their advantage, to lull others into a sense of security and lead them into traps that'll butcher the enemy. Kobolds are clever and proud, and only serve themseleves or the dragons they believe they're descended from. These are some of my favourite creatures. Kobolds are a pretty common early-level encounter. They're small and have a very low challenge rating, which means you can throw a whole pack of them at the players without worrying too much about murdering them too early in the game. Even the Monster Manual goes to some lengths to describe how pathetic they are. "Kobolds speak Draconic with a voice that sounds like that of a yapping dog," says the Manual. They're the chihuahuas of the D&D world. But that can make them dangerous. 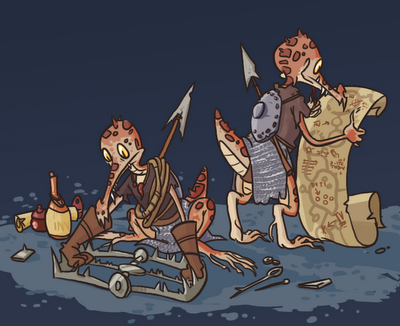 They're expert trap-makers and you'll spend more time avoiding them that you will fighting the little creatures themselves. There's the infamous Tucker's Kobolds, a group of completely average kobolds which specialized in guerilla tactics and dangerous traps instead of direct confrontation, designed to challenge players at high levels. There's also Pun-Pun, a demonstration about how the rules of the game can be broken to create a ridiculously powerful character. Wizards later released another book, Races of the Dragon, expanding on kobolds, making them more intelligent and conniving, and listing futher specialties and qualities. Later illustrations of kobolds in further books and magazines went on to make them a bit more evil looking, but I've always preferred that their cruel minds were hidden behind an adorable, pathetic exterior. Worst death I ever faced was at the hands of a swarm of angry kobolds, led by a frost giant in disguise.